You never know how a speech or story can inspire a child, encourage them to try something new, or open their eyes to something completely different. A friend once told me that he knew he wanted to work for NASA the day he heard a NASA employee speak at his elementary school. And as amazing as it seems, that friend went on to have an incredible career at NASA, which included some pretty fascinating opportunities. I’m certain that the elementary school speaker that spoke that day never had any idea that he inspired a young man to a lifelong goal, but you just never know how and when you are making a difference in a child’s life. Everyday we inspire children, our own and others, with our stories, compassion, smiles, and encouragement even if we don’t stop to really think about it. Some children know what they want to be when the grow up from a young age, and some require time to identify their passion. I know many adults who are still searching for that special career role that really fits them. 🙂 After our Career & Vocation Week, we heard many students re-telling their presenters’ stories, so there is no doubt that a good number of them went home with new ideas and dreams. Throughout the last week of November, Fr. 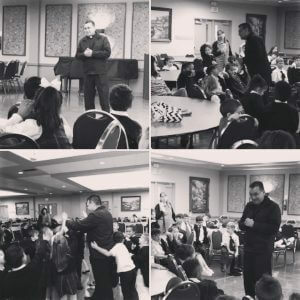 Antonio, our parish pastor, spoke individually to the primary, intermediate, and middle school students about his vocation and what life is like as a priest. It was a beautiful opportunity for our students to learn more about Fr. Antonio and his personal journey to the life God called him to lead. 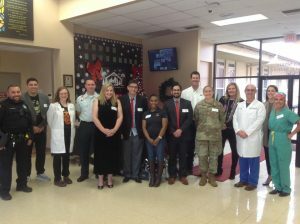 On Friday, November 30th, we had 20 presenters speak to our students on a variety of careers ranging from law enforcement, veterinary medicine, and hospital administration to sales, marketing, and finance. Our students couldn’t have enjoyed a more diverse group of careers to learn about that day. Our presenters shared their educational backgrounds, information about their professions, and stories about their experiences. We appreciate the time, preparation, and presentations that each speaker gave, and we hope that one day our students will realize their dreams that might have blossomed from an incredible speech on a Friday afternoon at Holy Spirit.